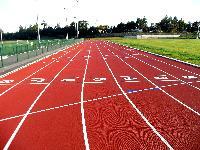 Our Athletic Track is a pre-fabricated rubber athletic tracks and is a new technology and is replacing the old PU track. It is embossed one-time and workmanship gives the product very good quality. 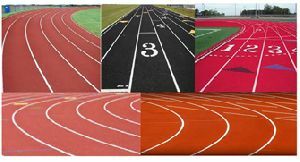 Ventilated Running track is a combination of SBR Rubber which is mixed with specialized PU laid with paver machine maintain a thickness of 9mm. 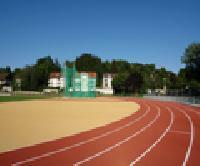 On top 4mm thick EPDM granules mixed with PU binder are sprayed with a specialized machine maintaining a thickness of 4mm throughout. 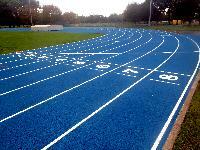 We are one of the few companies in India who have their own machines for this kind of specialized running track. 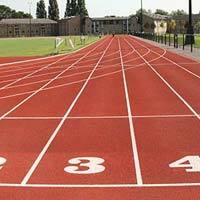 Our company name figures amid the prominent Suppliers of Olympic Running Track and offers the most lucrative deals to the patrons. With the assistance of our safe and automatic warehousing system, we are able to store the entire lot of products in a secured manner. 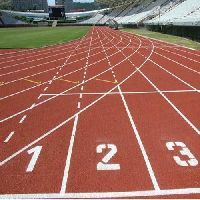 The entire lot is cross checked at regular basis for ensuring complete safety of the products. 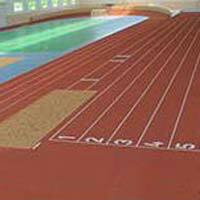 Asian Flooring India Private have in store for our clients a broad range of Running Track, which is available in diverse designs, patterns and colors. With the aid of our quality controllers, we stringently test the entire array ensuring its conformation with the international quality standards. 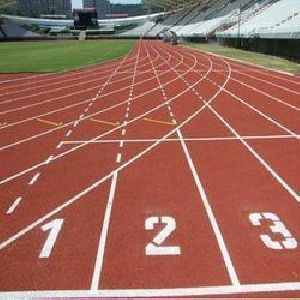 Synthetic running track is made out of sbr epdm rubber granules mixed with mdi polymers to withstand toughest abuse in all weather conditions with the life span of more than 10 years.